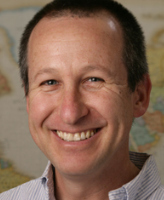 Asher Kaufman, associate professor of history and peace studies, has been appointed director of doctoral studies at the University of Notre Dame’s Kroc Institute for International Peace Studies, effective January 1, 2011. He succeeds Robert C. Johansen, professor of political science and founding faculty member of the Kroc Institute, who is retiring next year. The Kroc Institute offers a Ph.D. in peace studies in partnership with Notre Dame’s departments of history, political science, psychology, sociology, and theology. Established in 2008, the program now enrolls 13 students. Kaufman says he plans to enhance and clarify the interdisciplinary character of the program by initiating a series of discussions among faculty and partnering departments about the opportunities and challenges of each jointly-offered program. The doctoral program trains students in the rigorous interdisciplinary study of peace and war. It prepares graduates for research and teaching careers in peace studies; for positions in the peace and conflict subfields of history, political science, psychology, sociology, and theology; and for work as peacebuilding practitioners employed by intergovernmental or nongovernmental organizations. Kaufman has taught at the University of Notre Dame since 1995. He is the author of Reviving Phoenicia: The Search for Identity in Lebanon, and he is completing a book on the Syria, Lebanon, and Israeli tri-border region.